Property 4: Luxurious Lakeside Home just minutes from Flathead Lake Access! Sleeps 9! Property 5: WATERFRONT CABIN WITH THE VIEWS OF TWO ISLANDS AND MAJESTIC MOUNTAIN BACKDROP! WATERFRONT HOME ON FLATHEAD LAKE with 275 Ft of Lake Frontage! Property 6: WATERFRONT HOME ON FLATHEAD LAKE with 275 Ft of Lake Frontage! Property 8: Luxury lakefront property w/ private hot tub, game room, dock & firepit! Property 10: Lakefront retreat w/ great water views, private hot tub, sauna, & dock! Dogs OK! Property 12: Orchard House - On the Lake with a boat dock. FLATHEAD 'On The Lake' Custom Log Cabin...Enjoy Year 'Round!! Property 14: FLATHEAD 'On The Lake' Custom Log Cabin...Enjoy Year 'Round!! Property 20: Luxurious 5500 SQFT Lakeside Home just minutes from Flathead Lake! Sleeps 10! Property 21: Spacious yet cozy home w/mtn & lake views - year-round outdoor adventures! Property 27: Rustic charm w/ modern amenities, an expansive back patio, lake view! 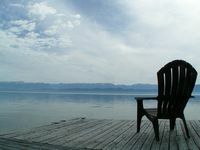 Property 28: Waterfront, Beautiful Flathead Lake, Panoramic Views! Peaceful, ground floor condo by the lake surrounded by endless outdoor pursuits! Property 32: Peaceful, ground floor condo by the lake surrounded by endless outdoor pursuits! Flathead Lake w/private boat slip - Luxury Lakefront. Swim, Boat, Glacier Park. Property 36: Flathead Lake w/private boat slip - Luxury Lakefront. Swim, Boat, Glacier Park. Property 45: Cozy lakefront log cabin w/ lake views, a wood stove, vintage decor, & dock. Grandma's cabin in the woods on the lake! Property 46: Grandma's cabin in the woods on the lake! Cozy cottage with an unbeatable view! We thoroughly enjoyed our stay on Flathead Lake. Shari welcomed us upon arrival, answered questions and offered recommendations for dining in the area. Finding the cottage was a little challenging, but the written directions provided made all the difference. The space is small (especially the shower), but just fine for two adults. And the view off the cottage deck - or down on the dock - is so beautiful. The color of the water and the mountains beyond change by the minute, it seems, and the sunset pinks are spectacular. Easy access to Lakeside and beyond.